Pancreatic cancer, the third leading cause of cancer-related deaths, is projected to be the second by the year 2030, according to a study in the journal Cancer Research. The five-year survival rate is only 8 percent, making it the only major cancer with a survival rate in the single digits. Despite rising mortality rates, pancreatic cancer is under-researched and underfunded, and there are few Food and Drug Administration-approved treatments to combat the disease. With the current pipeline for drug discovery taking 10 to 15 years from the laboratory to use, and an estimated 41,780 who will die from the disease this year alone, time is of the essence. 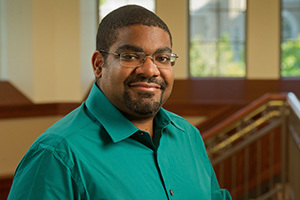 Now, patients suffering from pancreatic cancer may soon face better treatment options due to the latest discovery by Reginald Hill, Archibald Assistant Professor of Cancer Biology in the Department of Biological Sciences at the University of Notre Dame and researcher at the Harper Cancer Research Institute. Hill published a paper entitled, “Cancer-Associated Fibroblast Exosomes Regulate Survival and Proliferation of Pancreatic Cancer Cells.” Hill’s research focuses on drugs that are already approved by the FDA to find out why those drugs are not working in patients with pancreatic cancer. Much of the work published by researchers in the field has revealed that the majority of pancreatic cancer cases are resistant to chemotherapy and unresponsive to drug treatments found to be effective in other types of cancer. Most new research has focused on destroying supportive cells. However, those studies concluded that when the supportive cells were attacked, patients actually developed more advanced cancer. “It was like poking holes into the area around the cancer cells and allowing it to grow,” he said. Hill focused on blocking the release of exosomes, preventing the relay of information from supporting cells to cancer cells — which increased the efficacy of chemotherapy. This study, recently published in the journal, Oncogene, suggests that using an exosome blocker, which is nontoxic, in combination with standard-of-care chemotherapy will increase the treament efficacy of those with pancreatic cancer and many other cancers as well. The lack of effective treatments available to help thousands of those with pancreatic cancer is what drew Hill to his research. This latest discovery paves the way for those patients to have greater hope. The Harper Cancer Research Institute is how Notre Dame fights cancer. Located in South Bend, Indiana, its researchers are dedicated to conducting innovative and integrative research that confronts the complex challenges of cancer. Learn more at harpercancer.nd.edu.